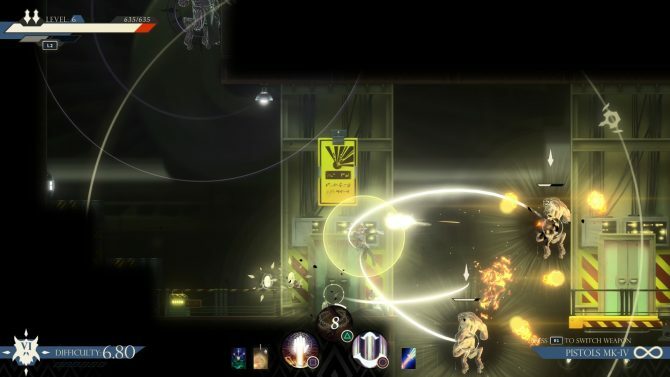 Seraph is an action game developed by Dreadbit that released on Steam earlier this year and has now come to PlayStation 4. 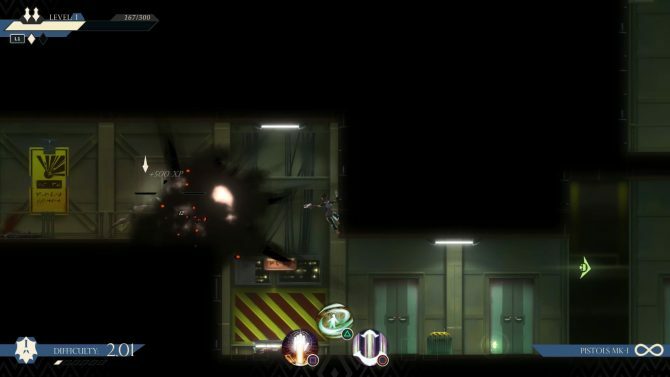 Playing as an angel who has mastered “Gun fu” you battle daemons (demons), upgrade your character, and participate in various modes of gameplay. The narrative has some interesting themes, mainly the futuristic portrayal of Judaeo-Christian elements. A multitude of customization options, both on a game-UI level and a gameplay level, help you mold it to whatever type of play you prefer. However, both of these major portions don’t go far enough to make the overall game compelling. An interesting premise doesn’t go beyond superficial references, and a large quantity of incremental increases to your power dilute the experience. For those who really enjoy customizing the elements of how you play, Seraph has a host of options for you. Upon starting a new game you can chose from standard, hard, or extreme modes, all of which amp up the difficulty along a slider. Along with those usual modes you also have a speedrun and Twitch mode, the latter of which allows viewers to comment and change gameplay for better or worse. Each mode offers you the ability to disable the tutorial level, something I greatly appreciate, as well as automatically skip conversations and hide gameplay hints. These options aren’t usually found in most games, and really help you find a play style you like more than a standard mode. 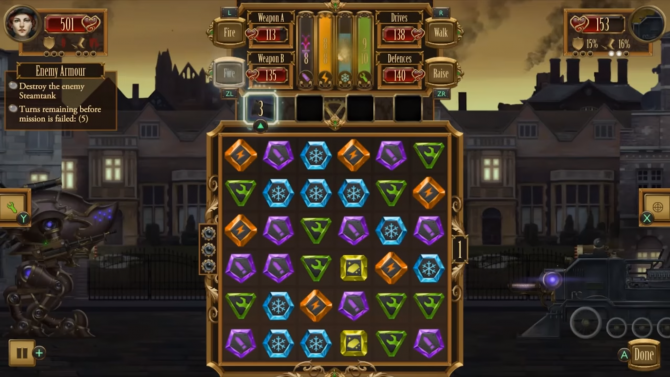 It also incentives multiple playthroughs in order to test out each option available. On the main menu you also have daily challenges with its own leaderboards, rewards, and modifiers. A survival challenge is also available, with its own separate leaderboard and rewards for those who can maintain their health during the gradually increased difficulty. While the main draw here is to bring in players consistently, its also a nice, shorter way to play something to completion. The main game isn’t overly long; you could most likely beat it in a day if you’re focused enough. The daily challenge takes significantly less time, and guarantees rewards that you might have to look for during the main mode of play. These rewards for challenges feed into the upgrading backend of Seraph, as you can deck your player with a myriad of active and passive abilities or boosts to help you against the daemon threat. Upgrades are broken up between Oaths, Transmutations, and Rebirth. Oaths are slots you need to use shards to fill in to activate various passive and modifying abilities. The greater your shard quality (which is attained through fusion) the higher percentage your boost is given. Different Oaths affect your weapons, defense, and offense capabilities. While I prefer modifiers over passive boosts, neither are very significant or noticeable during gameplay. Because of the minute nature of the increase in percentages for each, dramatic shifts in power are absent. 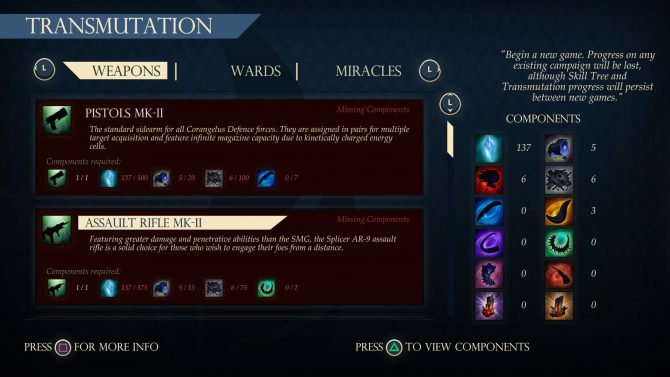 Transmutations is essentially the crafting portion, where you can use components gained in the field to create new weapons, wards, and miracles, which can Ed for offense, defense, and active abilities, respectively. Weapons, once created, have to be found in the world to be used, and none last very long due to limited ammunition. Wards are, much like the Oaths, somewhat insignificant due to the small level of impact. The only immediately visible effect is on your maximum health, but even then its a small portion. Rebirth is essentially like when you prestige in mutliplayer shooters: you give up the progression you have made for permanent buffs. While in other games you give up progression for cosmetic abilities since its player versus player, Seraph allows for more long-reaching gains due to its player versus game focus. The only player versus player element you will find is in chasing after people on the leaderboards. Defeating daemons, bosses, and discovering logs will open up entries in the Codex which acts as a bestiary and journal from which you can re-read any of the lore-focused texts found in the main game mode. 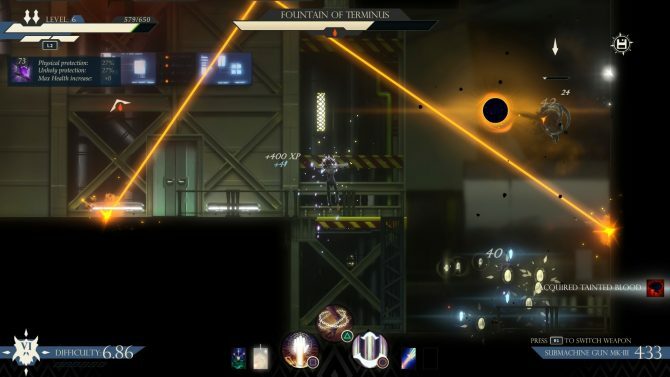 Seraph’s narrative is entirely text based, from dialogue between the player character and others, and from logs you will come across while exploring the map. While only delivered in small bits of information, the simple premise is that you are a type of celestial being occupying a female body and imprisoned on a spaceship prison of sorts. You are broken free by an incursion of daemons on the human plane of existence, which was most likely caused by yourself in order to escape. A clever mechanic is that defeating enemies allows you to reabsorb pieces of your former power that was disbursed when the daemons were summoned. This also acts as the experience system and makes sense in the context of the plot, something rarely achieved. There are some hints at theological concepts such as references to capital-H “Him,” as well as The Faith, your status as a sort of angel, and the daemons you fight. Nothing overt is really done or said throughout the plot, and none of those elements are taken very far beyond surface level mentions. It is a bit disappointing given both my familiarity with Judaeo-Christian themes and the potential in adapting them for different angles afforded by fiction. Language options extend from English to French, German, Italian, and Spanish for all text. Seraph even has a webcam bounding box and Twitch integration for those who frequently stream gameplay, a very nice tough. Video and audio options are rote: brightness, SFX, and music sliders only. However, control options allow you to rebind any button, another welcome feature not often seen. This allows you to switch up the distribution of abilities and control options during gameplay for something you may be more comfortable with, or feel is more efficient. Rebinding controls also opens up Seraph for those not normally catered to, that is, those with physical disabilities. Players who desire a clean start can also choose to reset their game save, starting back at square one. 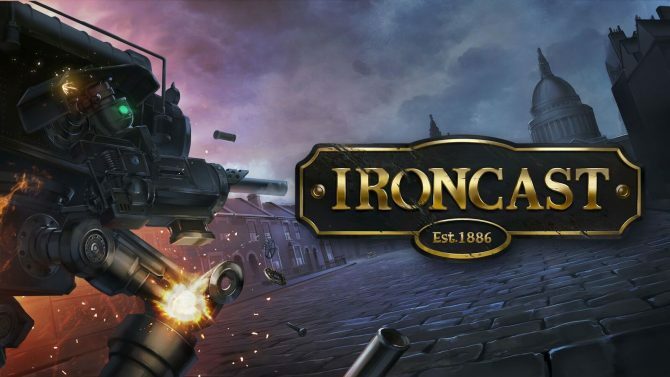 During the game proper you will be doing a lot of running, jumping, and shooting, and thankfully the last part of that is handled by an auto-aim system. This allows complete freedom of movement without having to modify your aim separately, which most likely would have ended in tragedy. Instead you can simply hold down the fire button as you focus on movement to avoid enemy daemons intent on your destruction. Helping you evade is the ability to shift, tied to L2 by default, which gives you a small boost while on the ground or in the air, in any direction. While the shift recharges, your health can only be replenished by finding yellow light chests throughout each level, or by certain passive abilities. Your HUD will give you information about what equipment you have on currently and its boosts, as well as active abilities and their assigned buttons, the current difficulty (which increases based on performance), and your active upgrades that are chosen upon leveling up. While you will always have a base set of pistols for use, you can pick up better weapons on the field. You can only ever carry one of these at a time, and each has limited ammo that can be replenished at certain lockers or chests, but it will always be something you want to rely on for tougher enemies. 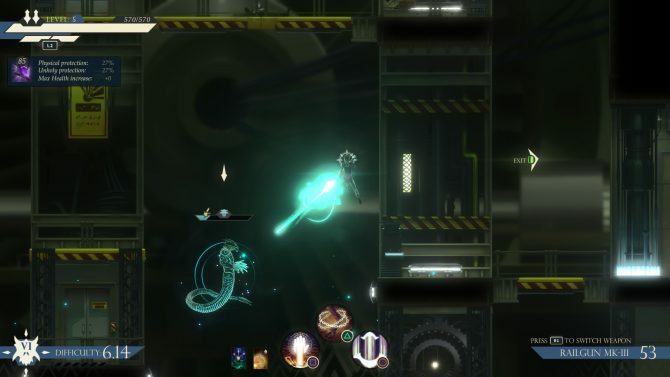 While the layout of Seraph might make you think its a Metroidvania, with a large overworld map to explore full of secrets, reality is much more compact. Instead of a large map you are given small compartments to explore, transitioning from one to the next via an elevator that will only open up when the boss for each compartment is defeated. While the area at any given time is never quite so large, it does have enough space to allow for exploration which is rewarded in the form of more ammo/weapons, experience, and temporary boosts. Travel is one-way, guided by an ever-present indicator on the HUD guiding you to the threat that needs killing, and then the door to progress. Environments become rather repetitive, as the aesthetic elements aren’t switched around very much and instead it begins to feel too grid-based, too mechanized like a random generator working against you. This hurts the longevity, since every mode offered shares this foundation. 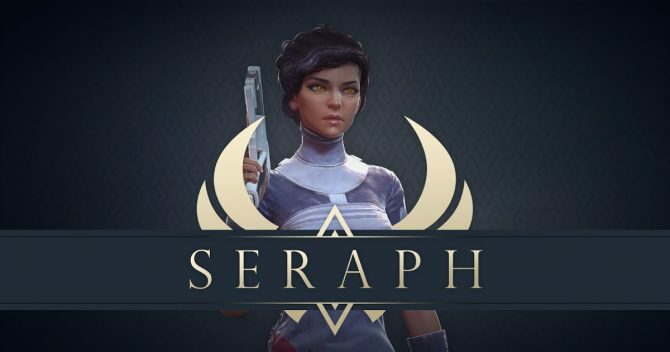 Despite some great options and customization available, Seraph’s narrative doesn’t go anywhere with what is presented or hinted at and the gameplay has many elements that don’t feel significant enough to be worth investing into. There is a lot to dig into both in mechanics, systems, and game modes, but the foundation of what is there doesn’t compel me to make multiple returns. Including Twitch integration and inclusive options for all opens up the audience, although I don’t think they’ll stick around after the first playthrough and toying with the additional options.